Wow with Easter just one week away ..our challenge this week is to Just Add Easter. Heres my baskets I made to sell for my latest show. The papers are retired on these but they were perfect for the job I thought. I used the petite pocket die for these boxes and just rolled down the flaps. The bunnies were paper pieced for the eggs and a quick run around with a marker and I was done. I do leave myself in a tizz sometimes as only decided the Tuesday before the show to actually make stuff up to sell at the show. 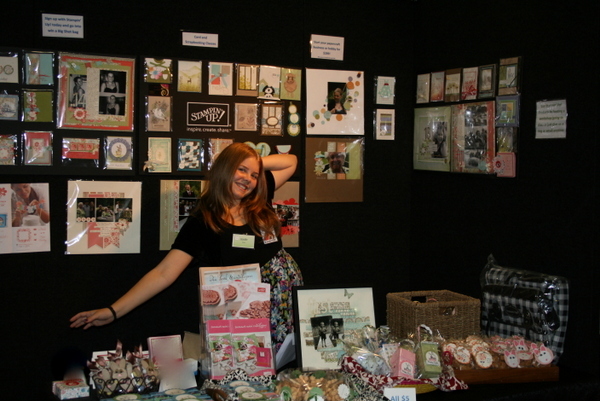 Heres my stall with my Daughter posing for Camera! I made acetate carrots using the petal cone die (contained orange choc easter eggs, boxes of cadbury eggs, my baskets and some little pillow box bunnies. The other tray was made by my downline Ali and contained home made fudge yum! Ive blurred out a couple of things as will be showing those to you on Sunday. 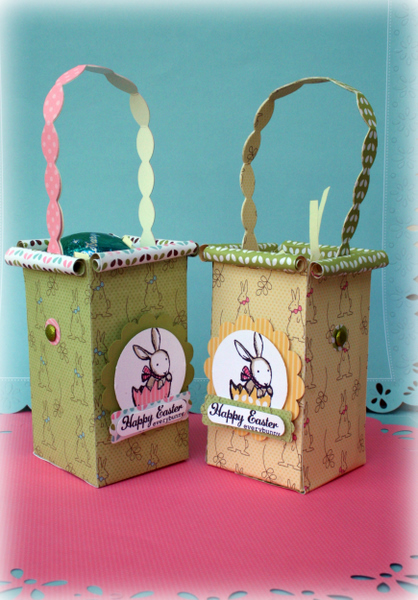 Love these cute baskets, Delys – what a clever way to use the Petite Pocket die. 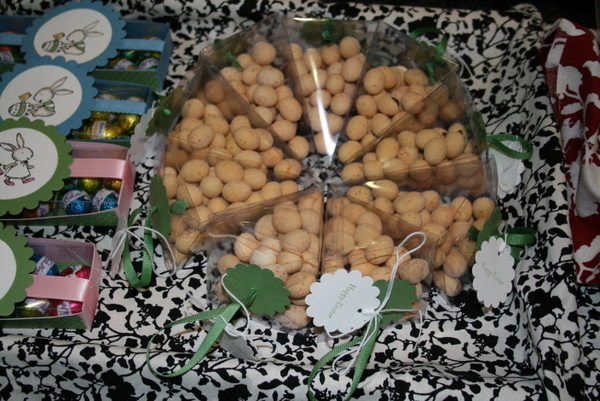 The paper-pieced eggs, and the rolled tops, are my favourite bits; too cute! How refreshing to see some ‘different’ baskets this Easter. Love them. 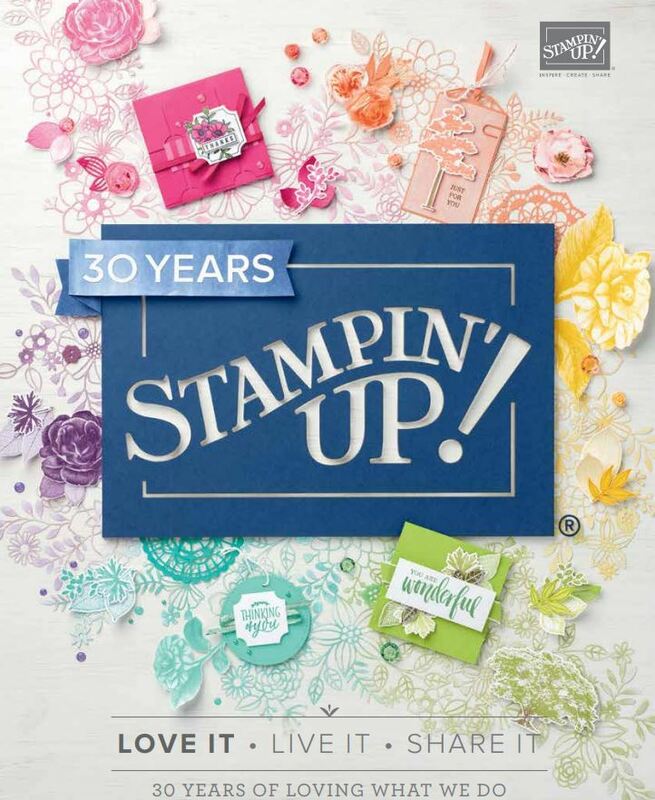 You’re very clever to use the PP die this way – the rolled tops look fabbo. Shame that DSP is retired, it is ever so sweet! As are your Easter baskets Delys, love the way you have rolled the tops, very effective. I love the boxes made from the Petite Pocket Die. Wow, you sure have been busy!